choice words added for good measure. My TSI Trading record has been updated. I was aware of the Net Asset Value issue several days ago, if not longer, but simply too naive to fully grasp the implications. At this point I understand that one way or another, eventually, the market will correct discrepancies in NAV. As TVIX reportedly has a net asset value of something less than $8 per share I decided that anything I could sell for above $8 was a gift. After studying/researching last evening and this early morning I came to the conclusion that to sell at this point was the best thing to do. My concerns for share price going forward were many. The issuer, Credit Suisse, announced last evening that they were ready to make additional shares available. My interpretation was that they was going to make it easier for short sellers to pound TVIX further with fresh ammo. Also, I pondered what would happen when all the millions of shares shorted yesterday were covered. Would we get a bounce to sell into? That would seem reasonable except for the fact that absolutely nobody owns a single share of TVIX at a profit. If I were a short seller I would just hold because I would know there are 25X more motivated sellers out there than buyers. And finally, I am beginning to understand that all these highly leveraged ETF/ETNs eventually fall to $0 in value over time…. long and short….. makes no difference. So if we see the S+P continue its insane rally, and I believe we will, there is no telling what this will be worth when the stock market finally crashes. 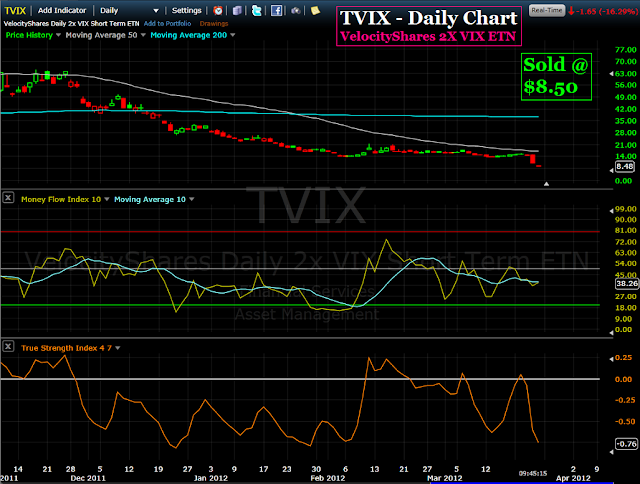 At the moment TVIX is selling at $7.53. The TSI Trader offers technical analysis of the stock market, gold and selected mining stocks using the True Strength Index (TSI). The True Strength Index is a sophisticated ‘low-lag time’ momentum indicator. Projected earnings of mining company stocks are provided weekly by Bill Matlack’s Metals & Mining Analysts’ Ratings & Estimates report published at Kitco and are used to highlight some mining stocks for study.